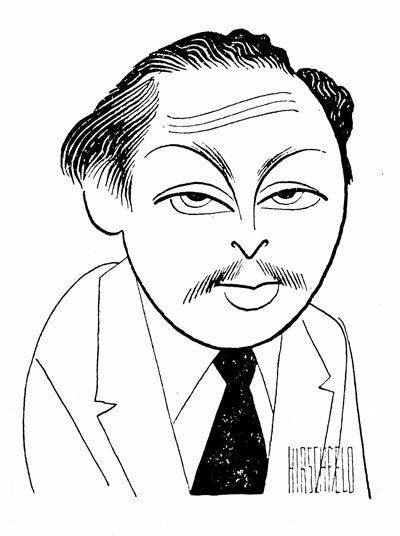 Over six decades, Hirschfeld saw all the major Tennessee Williams productions on and off-Broadway and created a landmark series of works based on the 1951 film of A Streetcar Named Desire. Beginning with The Glass Menagerie (1945), Hirschfeld captured Williams’ stage successes of The Rose Tattoo (1951), Summer & Smoke (1952), Camino Real (1953), Orpheus Descending (1957), Sweet Bird Of Youth (1959), The Night Of The Iguana (1961), and revivals starring Al Pacino, Katharine Hepburn, Elizabeth Ashley, Vanessa Redgrave, Charles Durning, and Jessica Lange. For Hollywood studios he drew the films of The Fugitive Kind (1960) and The Night Of The Iguana (1964). No other artist so thoroughly documented Tennessee Williams in the playwright’s own lifetime. Hirschfeld looked with an artist’s eye, but with a journalist’s intent, to capture Williams’ unique brand of stage magic. Like Williams, Hirschfeld was also unconstrained by reality, merging literal details with the playwright’s poetic vision. His contribution, Hirschfeld said, was to take the character, created by the playwright and portrayed by the actor, and reinvent it for the reader. He brought a new set of visual conventions to the task of performance portraiture when he made his debut in 1926. He enriched and intensified the viewing experience, communicating volumes in a single stroke. His signature work, defined by a linear calligraphic style, is serious graphic composition, informed by a distinctly modern aesthetic, and leavened by wit. Hirschfeld created not only a fascinating archive of Williams’ Broadway career (both original productions and revivals), but one that gives viewers, then and now, a real sense of the performance and personality of the actors who inhabited these roles. Both men, who hailed from St. Louis, never lost their wide-eyed Midwest wonder of people. They spent their lives studying their fellow men and women and interpreting them through their own prisms for their respective (and in many ways shared) audiences. For almost all of this work, Hirschfeld drew the productions before they received critical acclaim, often in out of town tryouts or rehearsals. Unencumbered by what others thought of the productions, Hirschfeld was free to observe Williams’ plays as intended by the writer and his theatrical team. Coming this January to the Historic New Orleans Collection, for the first time, these original ink drawings, augmented by related ephemera drawn from the Historic New Orleans Collection, will be assembled under one roof to give visitors a contemporaneous account, literally drawn from life, of the work of Tennessee Williams on Broadway and beyond.